MOSCOW (AP) Didier Deschamps walked into the interview room in the bowels of Luzhniki Stadium and prepared to answer questions for the first time as coach of a World Cup champion. A noise to his right caused him to turn, and his players rushed in. ”This is third time I got changed, and I still smell just as bad,” Deschamps said through a translator. He lifted the trophy as his nation’s captain following the first title at Stade de France in 1998, and now he watched Hugo Lloris raise it in a Russian downpour following Sunday’s 4-2 win over Croatia. The 49-year-old joined Brazil’s Mario Zagallo (1958-62 as a player, 1970 as a manager) and West Germany’s Franz Beckenbauer (1974, 1990) as the only men to play for and coach a world champion. His players had to be brawny. 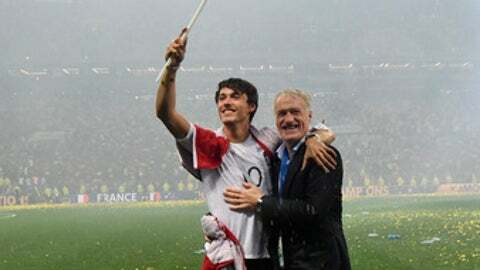 They lifted Deschamps after the match and flung him into the air, over and over. ”They’ve always been a little bit mad, my players,” he said. Deschamps was a defensive midfielder for Nantes, Marseille, Bordeaux, Juventus, Chelsea and Valencia from 1985-2001, winning the Champions League with Juve in 1996 and the 2000 European Championship with France in addition to the World Cup. He coached Monaco, Juventus and Marseille before taking over France in 2012. His national team coaching career included a quarterfinal loss to eventual champion Germany at the 2014 World Cup and a 1-0 defeat to underdog Portugal in the Euro 2016 final. It seemed like film noir – he said there’s an upcoming documentary coming out. Now the story arc includes happiness. He was embraced by French President Emmanuel Macron, posed for photos on the field with wife Claude and son Dylan, cradled one of the hardest trophies to win in sports. He hugged Dylan as the 22-year-old waved a French tricolor. Based on the losing experience of 2016, he revamped the team’s routine ahead of the final. Player relaxation was at the forefront. And it worked.